My heart always melts when a dog that we rescue gives me that special look. Our newest rescue did just that! Let me tell you about this special girl. We were sitting in front of the television trying to get a little rest and the phone call came in. A lady was calling to say she had abandoned puppies in her front yard. Brenda headed that way, and called and asked us to come and bring a kennel, gloves and treats to help get the dog. We found Brenda, and the nice lady who had called. She told us a stray dog had delivered several puppies in her yard, crossed the street, had another one and brought it back. 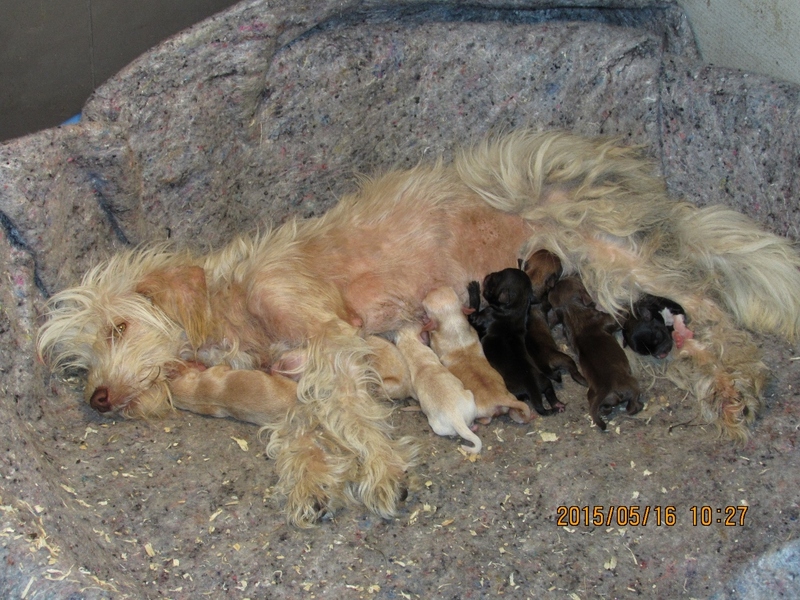 To make a long story shorter, the Mama was so thin and dirty and she had just delivered her 8th puppy. We scooped them up and brought them back to the rescue. We got them all cozy and placed a light over them. The poor Mama dog, just laid there and looked at us, as if to say thank you for helping. She was so weak we weren’t sure that she or her puppies would be alive by morning. So far, she has gotten a little stronger and is eating and drinking, but we feel she is still too fragile to bathe and clip her hair. So we are feeding her special food, giving her electrolytes and leaving her alone so she can care for her new babies. Those beautiful golden eyes, speak volumes, and I get that lump in my throat. We are not sure if she will be able to raise all 8 puppies, but she is a wonderful mom. This is the first picture I took of her. I know it may be hard to look at the shape she is in, but this is what happens when people fail to care for their animals. We know she is a special girl, and we will have more pictures of her soon, and you can see for yourself. Oh did I mention, I also brought home a skinny little kitten that was abandoned that same evening. She is being cared for by our granddaughter. Her new name is Elie!